It's been quite an uneventful week...tho i thot i better start trying to sleep train her and get her into routine by the time i go back to work. actually i could have done it earlier so i'm not sure how it'll be. actually she's been on a quite ok 3hr routine +/- 1/2 hour. tho it always gets messed up by the night sleeps because she does go for a longer stretch. still she's not dropping her early morning feed and wakes up at 1 or 2am for milk, and then 5am. it was bad last night cos i was so tired out by her awakeness at 2+3am. i crawled in and out of bed, giving her the pacifier and dropping off to sleep and waking again. i really want to refrain from giving her the pacifier to fall to sleep..but sometimes it's really hard. i'm starting work soon..yeap..and 3 day week. Thank God. there's so much to prepare but so little time....my EBM is taking up so much space in the freezer that my mil say got no space to put her cny food. i really dunno what to do with my frozen EBM. i'm trying out giving Eliza frozen EBM (of cos defrosted le la) tmr...cos i guess we'll need it when i go back to work. i'm also considering giving her bottled EBM so that i can better track her milk intake but a lot more things to do and the wait time for the milk is long, esp when Eliza's hungry earlier than i anticipated. gosh...to a certain extent it new problems arise with baby growing older...not easy. but her gurgles and conversations with me always makes my day. it's always so rewarding to see her smile, and genuinely smile at me. 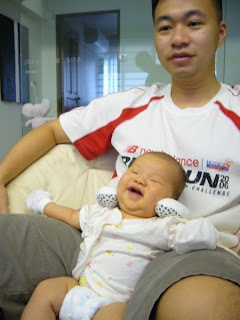 this was taken last week...before we went out to gaigai...she knows we're going out and is quite excited about it. E: i'm super duper happy! yay! we're going out! 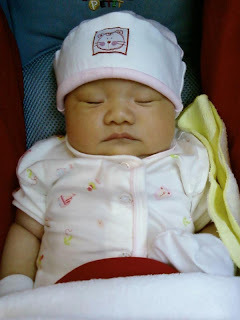 this was the day i brought her to my office to show her off...she slept all the way rite? then back home she's awake..ok...tho still sleepy. 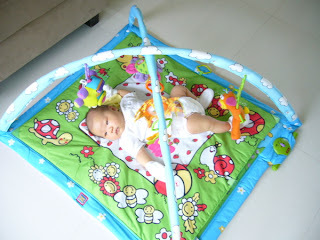 - leave her on her bouncy net (that's not bouncy at all) to stare at her linglinglonglong. couldn't really take both of us...my arm not long enough...so it's either her or me. Is baby going out too much? I'm going to my office tdy to discuss my going back to work with my boss...he's really nice, actually it was my boss who brought it up even before i went on maternity leave. he said we can tailor to work to suit my working times. i wasn't sure if i want to bring Eliza along to say hi, tho it'll be cool to do so. with the possibility of bringing Eliza out alone on possibly public transport, i popped to TM to run some errands last night. bought new diapers cos her current Pampers dry size S seems too big...and her pee/poo leaks from the side cos it's not tight enough. so i got the NTUC brand one..it's on offer and someone mentioned that it's soft & absorbs well too...ok i'll try it out and see. picked up my new jeans :) went to order Hagen Das cake for my sis (her bday on sunday). and...of cos bought a baby carrier for $148. (would have loved to buy the Baby Bjorn one..my sil says it's really good but no choice kiddy Palace doesn't sell it and i got its vouchers to use). waiting for her to wake up for milk and try carrying her with it. anyway yesterday my mil & i & Eliza went to the SporeExpo John Little sale. not much stuff other than $1.20 rompers. the most exciting thing about the trip was that i forgot to bring her pacifier. i reckon that if she really cries then we'll juz carry her. lo and behold...she did! cried and didn't want to be in the stroller...and i carried her up, discovered her pants was wet..oops pee overflow. anyway i guessed her crying is cos it was too loud in there (imagine those lelong ppl...shouting over the microphones about the hourly special). anyway after her milk...she was quite zonked out. but she cried again a while after we went back in *faint*. it's those loud cries...as if she's startled from her sleep. we tried swaddling her and viola! she slept all the way thru the rest of the shopping and going home. lesson learnt: always remember to bring pacifier. aren't they so cute? can u spot Eliza? it was fun chatting with mummies, enjoying the food and managing our cute lil babies (whether it's feeding them, carrying them, pacifying them, changing them etc etc). not easy but it's good to have ppl around who's going thru similar stuff, and sharing about our experience with our babies. 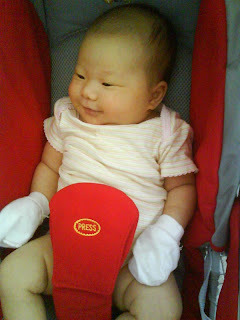 i came back safely from my lil trip to office with Eliza...and help from my sister who went with me. this is me with the baby carrier i bought yesterday. 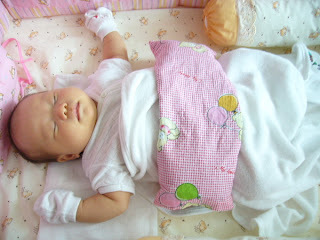 not too difficult to wear it and i think it is so comfortable for Eliza (look at her sleep!) cos she's in an upright position and my walking rocks her to sleep. so..it was sooooo shuang for her that she literally slept ALL the way from when i left home till i reached home (almost..cos she woke up when i got out of the cab). ok she did stir a little, frown a little when my colleagues were like trying to play with her...gosh otherwise she's super knocked out. 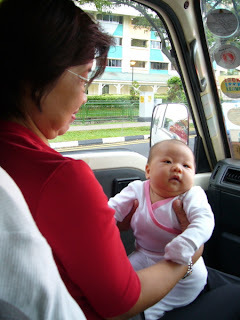 we took mrt & bus there and took a cab back. oh please remind me to never take a taxi from 5pm-8pm frm town area anymore, it cost me $22.60 (!?$%$^#). normally it would be like half the price. anyway i'll work till 3.30pm everyday..it was what i talked about and discussed with my family...tho my boss thot i could work a 3 day week. ok...when i told Ww & my family..they were like commenting that it could be good too..(if not better..so i kinda have off day..and my mil can go out). now i'm confused...cos i told my boss abt leaving early...should i go for a 3-day week?? argh...confused. 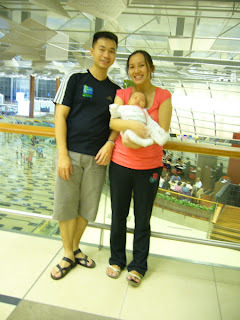 Weekends are kinda fun, on top of going to church..this weekend we ventured out to Airport Terminal 3! wohoo...so much for Ww saying shouldn't bring Eliza out coz there's germs...we intended to go on our own...lug the pram up bus 27 and carry Eliza. but thank God Ww's parents decided to join us for dinner at airport after their trip at Chinatown to buy CNY stuff. 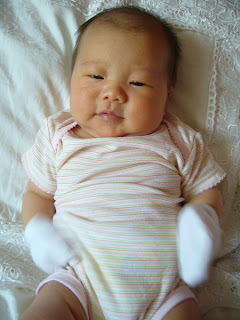 Eliza: after dinner i was making a fuss cos i want to be carried and mummy guessed..hungry! 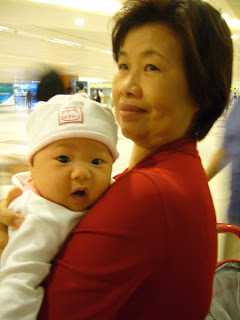 so my ah-ma had to carry me around. gosh..i look like i'm in winterland with that hat! 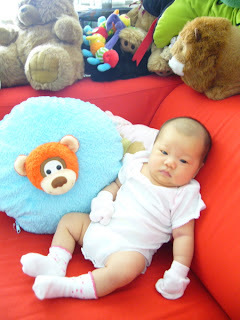 Eliza: i try to look into daddy's eyes..but he's too busy posing for this photo..tsk tsk..
yays! another family photo...it's so hard to get one cos i'm always the shutter happy one..sometimes i always forget to get someone to take photos when i'm so happy taking photos of Eliza. mummy's cell came and i was sleeping..daddy was to take care of me while mummy's having cell..and he slept too. 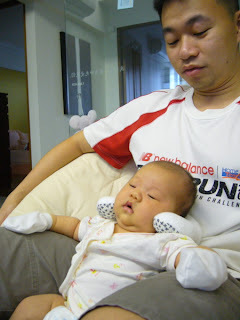 when we woke, he brought me to join her cell and i was kinda sleepy after milk and the way daddy carried me is so comfy! i was quite intrigued by the car hanging above me...why is it looking at me?? i didn't really know if i had one until i asked my gynae...and yeah couldn't feel a thing..whell not till few days later...it did feel sore down there..and i made sure i ate my painkillers. i was still asking the nurse what if i need to poo. The sleepless nights that follow are responsible for that, and also the joy of nurturing your child. Get help during your first month, preferably Mom or a confinement lady (so you won't feel guilt about Mom taking the night shift all the time). thot this was the same as no.2. ok..anyway it's sore..the most 'pain' was when my gynae removed the stitch. eep! 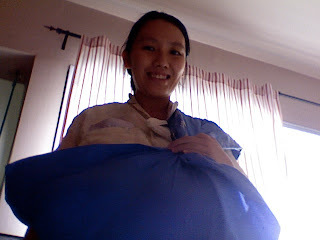 it was manageable at first...and there're challenges along the way.. Whether it is in the labour ward or post-delivery, take the pain relief that is offered you. Technology is there for a reason. Keep your options open. Plus, for me it was easier to concentrate on pushing with an epidural while watching the chart, rather than racked with agonising pain. yups. i still thank God for epidural...even tho it's a $600 thing. i still consider not going for it for my next delivery tho..must try the breathing method. 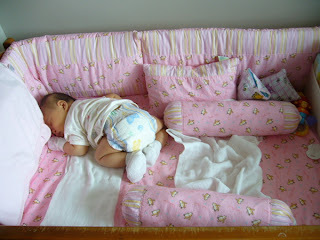 i think the culprit of lots of backpain is from taking care of kids, from breastfeeding (i lean on my bed with baby in cradle position but sometimes couldn't position properly), carrying baby (from the bed, from the sofa, from the bathtub...endless) , and just being plain old tired. Yup, i'm a mummy now. hello parenthood...new territory. I bought. but i haven't practiced it. I'm lazy i know but it was tough trying it...still i'll persevere. Eliza tends to fall asleep in it but there was once she was quite unhappy about being in it..i think i was quite a mess anyway...if u saw me figuring it out. 2. When he is awake and in the sling, sit him a little more upright and point out things to him as you go about your day. When you're brushing your teeth, make funny faces to him in the mirror, when you're pouring milk, explain how Mom drinks milk too. He'll love being part of your day. i guess what she meant was to talk to yr baby. and i find that there are times i'll just rattle on stuff, though i'm not sure she really understands what's it about, but she's learning. so i tell her daddy to talk to her more often esp since he's so busy at work and so tired when he comes back..she needs to hear his voice more. yup..so he did this weekend, engaging in conversation with Eliza, telling her abt the wedding dinner he's going tonight. 3. 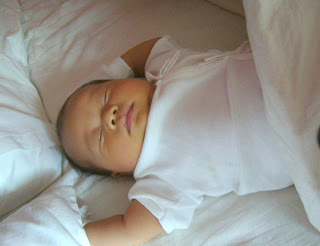 Spend some of the day with him in his crib or on your bed or on the floor. Talk to him, sing to him, animate some stuffed toys and do a little play for him, read to him. He just wants to see your face and loving glances at this point. somehow i have to...except for mornings when i'll scuttle around to make bfast, sort out her after bath stuff, i'll leave her on the bouncy net to entertain herself. 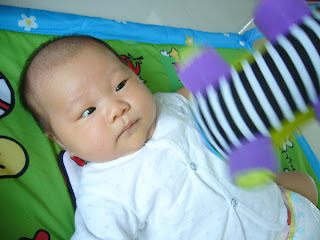 otherwise i'll usually play with her, try out the playgym (more on that another time..), recently i've started to read to her. singing...i tend to hum the tunes more than sing the lyrics...can't remem them well..so it's time for me to memorize more songs! 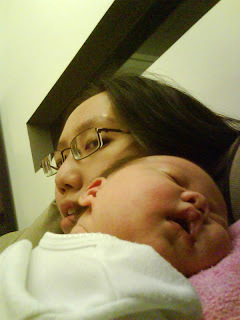 tho singing is used for trying to get her to sleep..
4. If you want to put him down for a nap, try nursing him on the side (with a small towel under you to sop up the spillage) and then once he is asleep, you can steal away. :) Just make sure he is safe wherever he is. i don't nurse her to sleep tho in the nights and early mornings i'll do so (so that i can sleep!) i used to nurse her lying down in the mornings (6-7am feeds) but i've given it up since i don't do it too well..and it's hard on my back, i dunno why..i think i didn't do it right. 5. Remember to feed and hydrate yourself too. 6. Keep reading material and your phone (important for impromptu brilliant Kodak moments and surfing or checking Gmail) near you in case you suddenly need to nurse and can't get up to get stuff. i try..but sometimes in the flurry of things i forget, or i've already put Eliza on my lap and it's mafan to get up and get a camera. moreover, my camera, hp, book, internet is in the different part of the house. 7. If there's someone else in the house to help you, ensure they have a mobile phone too so you can keep your phone on silent and send text messages when you need help and baby is asleep. 8. Create a routine for yourself and follow it everyday. It will help you manage your day better for now. 9. Rest as much as you can. It's impossible to nap with baby every time but just lying down helps. Get some me-time as well. 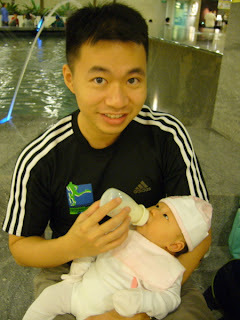 Let Daddy play with baby for as much time as he can spare for important Dad-bonding (children who have involved fathers are more self-confident and possess better self-worth as adults). 10. Believe in yourself. The most critical thing for this period is to build your confidence as a mother and bond with your child. Everything else should take a backseat. Enjoy every moment with baby for you'll never get back this precious time when they are so tiny. yeah so true. being with her 24hours is tiring but it's so precious. it writes: "..He does not view children as a sentence to eighteen years of hard time. He views it as a blessing. Interestingly, each of the blessings mentioned come at the cost of a lot of hard work. Children, crops and herds each require an incredible amount of sacrifice. It is hard to appreciate this blessing in the midst of the daily pressures. However, in the end, when you look back at it all, the rewards garnered warrant the efforts invested. There may not be a more life-altering event in your life than the moment you become a parent. Don't begrudge it; embrace it!" 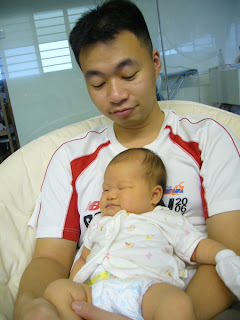 truly it's a long journey, i know it but i couldn't imagine it till Eliza came into our lives. although we plan things for her (and future kids) like our change in lifestyle, finances etc, you don't feel it until you experience it. true sometimes i wonder if i'm going to do the same thing day in day out...feed her, change diapers, play with her, get her to sleep..and the cycle happens again. (and i'm only on my maternity leave) but she surprises me everyday, i would look at her and melt. yesterday she said "googoo" which was a new sound from her normal 'conversations', and got me so amazed at her. God has blessed us with Eliza and i pray with her everyday (almost) for Him to be protect her, to keep her healthy, to grow well, sleep well, feed well, to grow into a lady who loves God. we don't know what the future holds for us and for her...but we'll enjoy every moment of it that God, by His grace, gives us. talk about life-altering moment...she really changes us...though i think the change on me is the most. (Ww commented in her early days that i'm quite protective over her) it's like she's a part of me, esp when i know she needs us so much. just as our marriage brought me to understand God's love for us in a new light, having Eliza is bringing us to understand God in a different way as well. 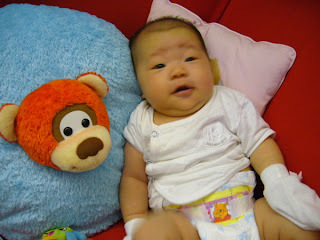 On wed, we brought Eliza for her vaccination at a baby&child clinic at st.81. we wanted to go on friday, but there were things i was worried about so we went on wed instead. we wanted to go for the 6-in-1 but cos i'm a hep B carrier the doc advised to have a separate vac for heb B & do the 5-in-1 instead. it's prob a bit more jabs cos the hep B one is given separately but there's lesser side effects. 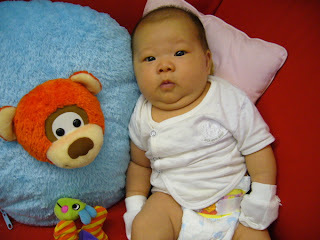 i think for the 6-in-1 baby may get fever and usually that's not good in the sense that baby's gonna be cranky. What Are “5-in-1” and “6-in-1” Vaccines? Note: The 5-in-1 injection combines vaccines against Diphtheria/Pertussis/Tetanus (DPT), Polio and Haemophilus Influenza type B (Hib) in 1 injection. The 6-in-1 injection combines vaccines against Diphtheria/Pertussis/Tetanus (DPT), Polio, Haemophilus Influenza type B (Hib) and Hepatitis B in 1 injection. 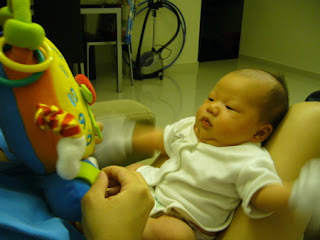 So...Eliza had her growth charted..
she's 5.2kg (!! big baby woh...she's the size of a average 8wk old baby..and she's almost 6wks old) no wonder she's so heavy! 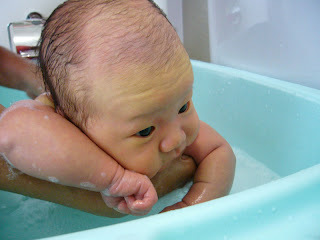 oh my chubby chubs. the PD said it's ok esp since she's TBF-ed. PD said it's usually due to what i eat, could be high fibre foods, so it makes the poop green. i can't remem what the PD said anyway...but she gave some cream to put and Eliza's face is now much better (aft 2 days). yays to baby skin! [About 60 per cent of newborns develop jaundice because their immature liver is too young to handle high levels of bilirubin. The excess amount is therefore deposited under the skin and eyes, leading to jaundice. Bilirubin which is the yellow bile pigment in the blood is normally removed by the liver. Before birth, the mother's liver does this for the baby. In newborns, their immature liver takes a few days to develop before it can eliminate the bilirubin efficiently. In the meantime, they develop jaundice in the first three to five days after birth. And it normally clears within seven to 10 days without treatment. And yes her 1st jab we got to experience with her. we told her that even though she doesn't really know what's going on...it's for her good. 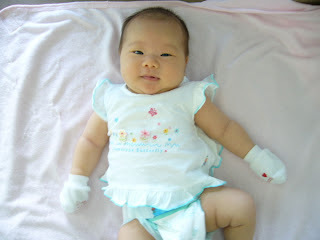 (she was still like happy mood from the change in environment...looking around curiously). imagine minding your own business and suddenly getting jabbed. 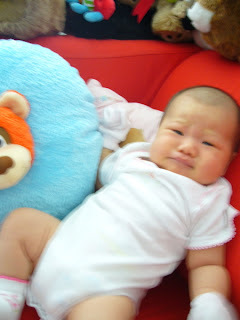 oh her cry when she felt the jab! but it was short...the moment i carried her in her fav position, she gave a few whimpers and quietened down...soothed consoling. after that she's back to her curious-y self again. aww...my brave gal! mummy dressed me up in my new clothes when i go out (it's to church for now), she says i gotta wear them all before it gets too small for me. and she propped me up on her bed to take a photo of me sitting...i love sitting up! i suspect Eliza's in a growth spurt this week (again!) cos she is hungry every two hours instead of her normal 2 1/2hrs or 3hrs. 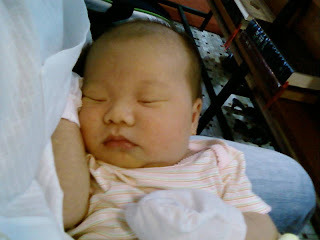 so she woke to feed at 12mn, 2.30am, 5am, 630am, 745am. i was quite ok in the beginning till the morning when i was so sleepy (and Eliza as well) that we slept right through her bathtime...only waking up at 9+am. I've come to accept that unless my mil is home while we're having cell (cgl cell, Ww's cell or my cell), Eliza's become my priority cos if she's not asleep i'll have to carry her around and play with her till she does. it's ok right after her milk when she's happy to play quietly (which we had the time to join in for cell worship time), but after that when she's tired but can't sleep on her own, i'll have to rock her to sleep. i still haven't mastered the art of getting her to sleep even though i know what to do...whell sad to miss out the time with cell i felt i had to just join them (or some of them) downstairs for dinner with Eliza. it was a good thing that she just had her milk and was in a happy mood. so we put her on her stroller, wrapped her up in her long pants and hat and went for dinner at the coffee shop downstairs..it was a rainy day that's why she seems like in winter clothes. It's Eliza's 2nd time to church, this time we're a lil more prepared. 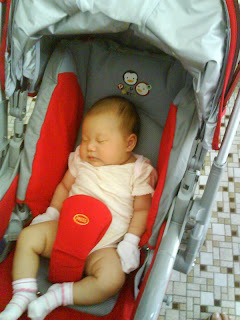 still tried using the stroller but not very successful (cos it's tiring to carry her all the time). 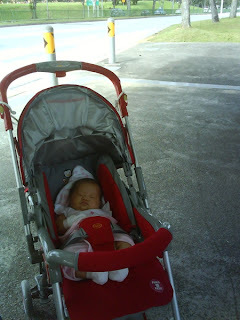 she'll wake up after abt 10mins in the stroller. so daddy has to carry her..and she fell straight to lala-land. ahah...caught this sweet pic of her...tho i thought she didn't look quite like her. wonder what was she smiling at. she's only 5 weeks old and i feel she needs us so much, from her most basic need - milk, to interacting with her. 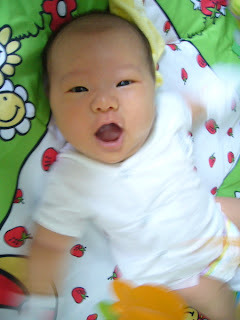 just played with her after her milk and felt that she really enjoyed our playtime together. i just felt like her smile as become more than a muscle exercise but a genuine smile showing that she really enjoys what she's doing. it's a precious time cos within 1/2hr or less she'll be restless and want to be carried or want to sleep but can't sleep. - carry her in her fav position, pat her and sing to her. when she's calmed down i can sit at the sofa, watch tv and con't doing the same stuff till she falls into deep sleep. at night she's better...i think and hope she really knows that it's night time so after drinking her milk, changing her diapers (if needed) and trying to burp her, i'll swaddle her and leave her to sleep. occasionally she'll still make noise and i'll carry her and pat her till she falls asleep. so really, sleeping is quite an art...at least getting baby to sleep is. it's mummy's rest time actually. so while this schedule keeps up, i wonder when will i get a proper good night rest...even though i can last quite well with spurts of sleep, it would be nice to have a nice long 8 hour sleep. As much as i love to spend time with Eliza, i need to spend time on myself...even if it's just the basic stuff like eating, yes eating; going to the toilet, bathing, surfing the internet, reading some stuff and even nap. And if there's no one to help me out to carry baby, or sometimes feed her..really, i can only steal time when she naps...like now! and her naps range from as short as 1/2hr to 2hrs. sometimes i can't really predict cos she'll wake up earlier than usual. So advice to all to-be-mums, help around the house is so essential. like my friend SH told me accept any help, ANY. 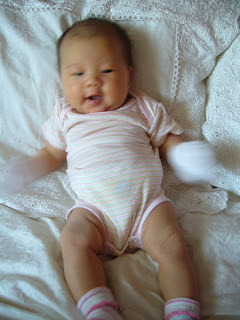 sometimes i would feel like i want to do everything, from bathing her to feeding her to coaxing her to sleep. 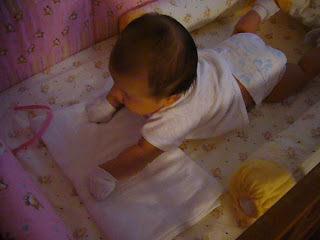 but sometimes it's just too tiring, and even help from Ww to change her diapers is a relief. sometimes my FIL will entertain her while i go take my bfast, or my MIL will feed her and coax her to sleep, even Ww takes his turn at coaxing her to sleep. I'm really fortunate to not need to do too much housework cos i stay with my in-laws and my MIL does the washing every morning, (i help by keeping and folding all the clothes), she also cooks great meals so it's something i don't have to worry about. this is really important cos as much as nutrition is so important during the first few weeks after delivery, most of the times i just feel i don't have the energy to bother about it...much less cook! 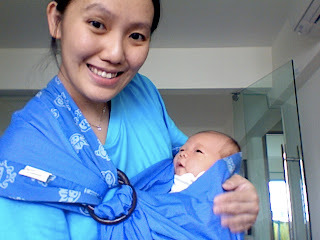 sometimes i feel hungry but circumstances are such that it's hard to eat and carry baby to sleep (i still haven't mastered the art of using the sling). I really admire those mums who do their own confinement, it's not easy, especially if it's your first time and everything is so new. and you need that first month to rest and recuperate...and of course to gain confidence in taking care of baby. like now i'm perfectly fine left alone with her...once i even took a bath (a quick one..just in case she woke up and i can't go out in time to console her). I don't think i'll get to finish this...it's estimated 45mins till Eliza wake up from her nap. gosh it's her 2nd 'proper' nap...twice i had to coax her with the pacifier...and she was seemingly asleep with it...and if i remove it she'll cry after 1 min (which is when she realizes it's not there). I'm trying to really regulate her schedule into a 3 hour schedule now..so when i feel she's really not hungry (ie 1hour or even 1 1/2hr after her feed), i'll hold her off with the pacifier or carry her around till she sleeps or till the time's right to feed her. sometimes it's a lil less than 3 hours..the last interval was only 2 1/2hrs but she seemed really fed up with the pacifier and turning red sucking it. 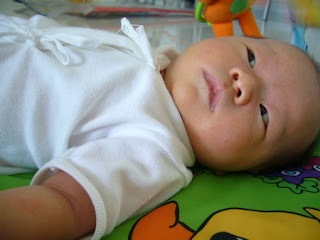 (must be wondering how come there's no milk coming out from the pacifier). she tends to be awake after her bath, although she's quite asleep before her bath as i'll usually feed her b4 that. i learnt never to bathe a hungry baby...it's hard to carry her, bathe her, much less clothe her when she's crying for milk. 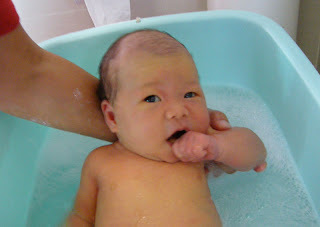 so a satisfied baby is a happy baby...see why her bathing photos are always so happy. 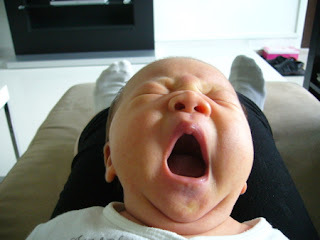 next interval to be awake is the noon or afternoon, then a good nap..and then it's the fussy evening. last night she was awake from 7plus till 1130pm. 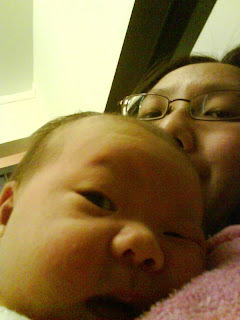 i was so tired out by 10pm that i left Ww to coax her, pat her and sing to her to sleep while i dozed off. woke to feed her groggily at 11pm which she finally fell asleep after that. 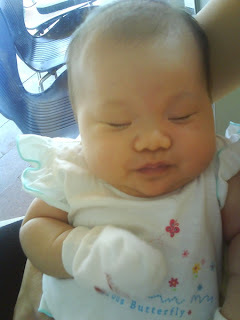 thank God she slept through till 2am (gosh i had time to dream...how nice! ), then woke at 5am and then at 730am. Now that it's Jan and i'm 4 days out from my confinement, things still feel the same just that i can bathe normally, drink plain water and go out. Of course going out needs a bit of orchestrating...i need to make sure my mil is free, then if with Eliza there's a lot of barang barang to bring. meanwhile it's just a lil boring....so i'm looking forward to the weekend when we have cell over and church on sunday. i want to go out and buy CNY clothes but it seems like i still can't fit in much of my pre-pregnancy clothes. i can for some but i look fat in them...really! even my mil says so :( geez. so i'm still wearing my pregnancy clothes..which makes me feel a lil better...see? pregnancy clothes last till after the pregnancy. need to plan a time to go shopping tho i prob only have 3-4 hours..or mayb 6 hours out...before i start to feel engorged and need to pump milk out. the wonders and non-wonders of breastfeeding. now it's like my going out times are limited...unless i bring Eliza along and nurse her while we're out. 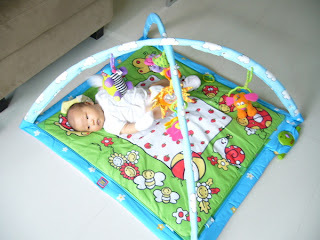 mummy's colleague bought me this play gym and i'm trying this for the first time..what are those flying things? eh mummy & daddy...why are they making noises and waving around? lap time with mummy...yawns..i think i wanna sleep!! another nice uncle & auntie bought me this clock which mummy brings it out for me to play everyday..(and uses it to 'record' my last feed). hmm...what's the time now? when we first came back from the hospital i wonder how to bathe her but thank God with my mil around, it was easier and i learnt from her. I had wanted to write about this but keep forgetting...about buying 4D. numbers like Eliza's birth date, her time of birth and even her NRIC number. obviously my fil bought those numbers once he knew it...(gosh i dunno how much he spent on buying these numbers). obviously it didn't come out the 1st week...but 3 weeks later, there was quite a commotion at home. cos her DOB came out as first prize. oops! and he didn't buy it. then came all the phone calls...which i realized then that my mil's friends/family have asked her for Eliza's DOB to buy 4d too..and one of her friends did win few thousand buying it. it was a lil frustrating for my in-laws since it was such a 'clear win' in a way. we gave little thought to it, knowing that the probability of winning any of these things are so slim, we can earn more investing money instead. but it was an interesting evening...my in-laws had to hang up the phone cos so many of their friends/family were like calling and they were frustrated i guess cos they didn't buy it.